This is a course project of CS528 (Computer Network). It simulates the activities of a gambling casino containing multiple blackjack tables. There are three modules in this design: dealer, gambler and bank. Several gamblers can connect to one dealer to play blackjack game. All dealers and gamblers can exchange chips from a bank. Communicating with bank process. In this communication, gambler is a client and bank is a server. By the communication gambler exchanges certain amount of chips. Then Reading the dealer list file, which contains all possible dealers¡¯ IP address. Then gambler tries to connect the possible dealers in the list. After connecting to an available dealer successfully, the gambler will begin to wait for the game start message packet from selected dealer. Otherwise if all dealers in the dealer list are not available, the gambler will sleep one second and then retry all possible dealers once again, utill he connects to one dealer successfully. When the dealer process discover that there has been enough gamblers (Six) requested in or the time of waiting for gamblers (5 Seconds) time out, the dealer will send a message packet to all gamblers participating in coming game to notify them the game will begin. Then gambler must submit the bet chips to the dealer and receive two cards (message packets) sent by dealer consecutively. Afterward, the first card of dealer will be sent from dealer so the gambler can know dealer¡¯s first card too. Then the gambler decides whether he/she will accept more cards or refuse to accept any more cards. The decision algorithm is very simple, if total points the gambler got is equal to or greater than 18, the gambler will standing, does not accept another card, otherwise, he/she will accept next card. After the result of game comes, the dealer will send a message to each gambler to inform them whether he/she is winning or losing. Then the game is finished. After the game ends, gambler will connect to bank to exchange chips once again. And the gambler must decide whether he/she will continue to play or to leave. In the implementation of gambler process, if gambler has played 10 hands, he/she will exit. Otherwise he/she will search possible dealers once again to get one available dealer, then replay another game. If he/she will exit, then before he/she exits, he/she will connect bank to report how many chips he win/lost totally. He all will return all left chips he/she has to bank. When the dealer process is running initially, before the dealer open a game it will connect to banker to exchange some chips. In this communication, gambler is a client and banker is a server. After close the connection with banker, the dealer acts as a server, which accepts the connection request from some gamblers. When the number of logged gamblers comes to six or the waiting time (5 seconds) time out, the dealer will stop accepting new gamblers and begin to play game with current gamblers in this hand. At this time, dealer is a concurrency server, which receive messages from and send messages to gambler process. First, it will notify all gamblers the game is beginning and receive bet chips report from each gambler. If he decide that the chips it has are not enough, it will connect to bank to exchange amount of chips. During the game playing, the dealer produces cards randomly. First it will send two cards to each gambler, then it will send its card information (one card) to each gambler too. It will also communicate with each gambler to get if he/she will accept another card and record each gambler¡¯s score. It¡¯s the dealer that decides when the game is finished and notifies each gambler that whether he/she wins or loses and how many chips he/she wins/loses. After the game ends, the dealer will connect to banker once again to report the winning or losing of chips and maybe exchange some chips too. Then the dealer closes the connection with bank and again acts as a concurrency server waiting for the gambler to log in. Process Bank provides two services, one for gambler, the other for dealer. It¡¯s one process but it listens on two ports (one for dealers, the other for gamblers). In the service for gambler, it will exchange chips with gamblers and it will report the results from gamblers. In the service for dealers, it will also exchange chips with dealers and it will receive the report from dealers after each game and calculates the result. In addition, bank process save all records of game activities (exchange chips from gamblers or dealers, report from dealers about game result, report from gamblers about their final win/lose result). In addition, bank also receives keyboard command to display all log records. The total chips in bank are a global variant for both program communicating to dealers and program communicating to gamblers. Banker program (acts as two servers, one for dealers, the other for gamblers. Each communication between client and server is a TCP stream communication. We create Stream sockets on each end of the communications. Before we began to write code, the first thing we have to do is to define the protocols amongst three processes. We decide to use string as the format of protocol. Just like File Transfer Protocol (FTP). In this way, each part of the project would not share a common data structure; they even can be implemented in different programming languages. In fact, in this implementation, Dealer is written using C++, while Gambler and Bank are written using C.
200+id return dealer id (account number). TcpSocket. TcpSocket is a wrapped class of based Unix socket functions. It is reasonable to create socket, send and receive a string message thought a socket. In addition, it will offer two address conversion utility functions. TcpClient. TcpClient implement a client side socket connection. Although Dealer is a server of game, when it buy chips from bank. It is a client too. TcpServer. TcpServer implement a server side socket connection. initCards initialize the card sequence in a random manner. It use the current system time and process id as seed to generate random number. This function waits for players to join until timeout or six players has come. When the first player arrives, it will set up a timer. Each player¡¯s info (including its socket) will be put into a player list that is dynamic array. After timeout or having six players, it will close the listening socket. This Function will accept a player, remember its socket. This Function send a string to a player and receive a acknowledge string from the player. It tells every player to start to play game. After sending the START signal, it will wait to collect every player¡¯s gamble. And if necessary, the dealer will contact bank to buy more chips in order to have enough money to play game. This is the function which do most of the work. Give every player and dealer himself two cards. Send the dealer¡¯s second card information to all players. Players may use this information to make their own decision to get cards or standing. Give every player's cards until he says STANDING. Give dealer cards until his point is greater than 17. Check every player to see who is win or lost. Send every player a notification to tell them win or lost. Tell each player to end game. Report each hands with players. This is the main function. In the implementation of process gambler, we employ nonblocking socket and I/O multiplexing (Select function) to implement the communication to bank and dealer. The function implements one game playing with a dealer. The function implements to search dealer list to find an available dealer for one gambler. 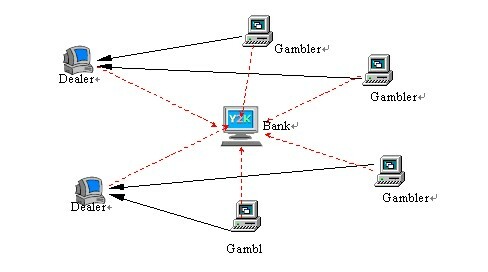 The function implements to connect bank to exchange, return or report win, lost result for one gambler. In the implementation of process bank, we employ I/O multiplexing (Select function) to implement the two servers (one for gamblers and the other for dealers) as well as accepting command from keyboard to print out log records. One bank, two dealers and six to seven gamblers participate in. The gamblers join the game asynchronically. Our program can accommodate new coming gamblers asynchronically. New gamblers will always search to find an available dealer. If one dealer is playing with other gamblers, it¡¯s listening socket is closed so no new gamblers can connect it successfully, then the new gamblers will try other dealers. We can run the program without the limitation of time and we also can control the time the program running. We also do not have limitations on the number of dealers and gamblers. One bank, one dealer and more than 10 gamblers participate in. The three process run well and we get correct records and result report from bank, dealer as well as gambler. The output of bank for one running: (bank is running on binguns, two dealers are running on ultra3 and ultra5, respectively. Two gamblers are running on ultra2 and ultra6 respectively. Gambler(ultr6) played 2 rounds and gambler(ultra2) played 3 rounds). Initially we have 100000 dollars. (1) Robustness. Our implementation is not robust enough. There are many exceptions in the communication. We just make our program exit simply. (2) Portability. We have just tested our programs in Sun¡¯s Solaris system. And we could not compile successfully in Windows. (3) GUI. Our implementation has no graphic user interface. It is NOT a real game.